Sue Beatrice's star map necklace shows storied constellations from Polaris to Draco. The night sky is nature's ever-changing light show. Sue Beatrice's necklace celebrates sparkly, stellar wonder with a section of the Northern hemisphere sky. With bright Polaris (the North Star) at its center, her textured swath includes storied constellations: Ursa Minor (The Little Bear or Little Dipper), Ursa Major (The Big Dipper), and a portion of Draco (The Dragon). 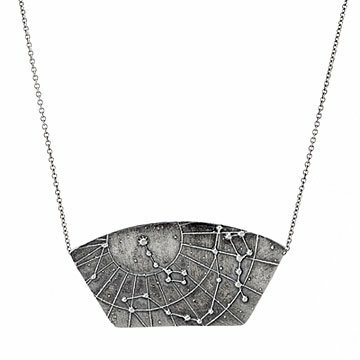 Suspended from an 18-inch silver chain (because gravity), her tribute to celestial beauty makes a enchanting gift for any stylish stargazer. Handmade in Sea Cliff, New York. Pendant: 2.1" L x 1" W x 1" H, Chain: 18"
Gently wipe with a soft silver polishing cloth.